Three days visiting fascinating sights such as the Summer Palace, the Temple of Heaven, the Forbidden City and Tiananmen Square and the Great Wall. Witness the ‘hutongs’ – the ‘back alley’ by cycle rickshaw and have lunch with a local family. Enjoy a performance of ‘The Legend of Kung Fu’ during your stay. Fly to Urumqi and stay one night at the Haide Hotel. Visit to the Museum of National Minorities and History, then the Hong Shan Park with a stop at the International Bazaar. In the evening fly to Kashgar for one night at the Yue Xing Jin Jiang International Hotel. Step back in time to medieval days as you wander through Kasghar’s famed Sunday Market. Visit the Id Kah Mosque and the Abakh Hoja Tomb. In the evening fly back to Urumqi for two nights. Enjoy a scenic drive past Kazakh yurt encampments to experience the beauty of ‘Heaven Lake’ located halfway up Bogda Mountain. 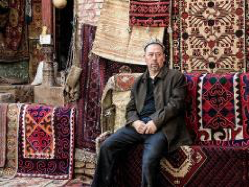 Pass through spectacular desert and small oasis towns on your way to Turpan and stay one night. Visit the ruins of an ancient city of Gaochang and the Bezeklik Thousand Buddha Caves, a picturesque site overlooking the lush river valley in the heart of the Flaming Mountains. Stop at the Astana Tombs. 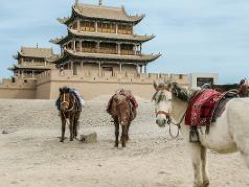 Visit the ruined city of Jiaohe, one of the architectural gems of the Silk Road. 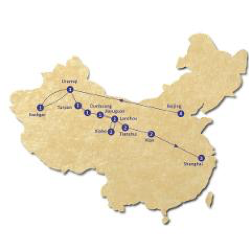 Join the high- speed train to Dunhuang and stay one night at the Dunhuang Hotel. Explore the night market tonight. Visit the Mogao Caves, one of the greatest treasure troves of Buddhist art. 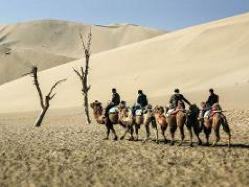 Stop at Mingsha Dunes, often called the ‘Singing Sands’ and climb the massive sand dunes for a great view of Crescent Moon Lake. Stay one night at the Holiday Inn Hotel. Visit the Great Wall Museum, an underground gallery’ located in tombs from the Wei and Jin periods of AD220-240. Stop at the Jiayu Fort, known as the ‘Impregnable Pass Under Heaven’. In the afternoon, take a high-speed train journey to Lanzhou on the Yellow River and stay two nights at the Legend Hotel. Today, you will visit the Provincial Museum, White Pagoda Hill, Five Springs Park and Water Mills Park. Drive to Liujiaxia Dam on the Yellow River tributary. Board a small boat and cruise through dramatic scenery to the Binglingsi Thousand Buddha Caves where niches and statues are cut deep into high cliffs. Continue onto Xiahe and stay two nights at the Aviation Hotel. Often referred to as ‘Little Tibet’, Xiahe is famous for the Labuleng Lamasery. As one of the six leading Buddhist lamaseries in China, it is home to thousands of cultural relics. Enjoy a scenic coach journey back to Lanzhou. Join the train to Tianshui and stay two nights at the Sunshine Hotel. 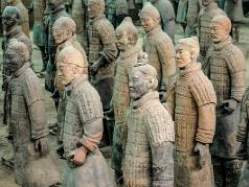 Marvel at amazing silent Army of the Terracotta Warriors that were created to guard the tomb of the first China’s emperor and see his unearthed bronze chariots on display in the Exhibition Hall. Continue to Xian’s premier attractions, the modern Shaanxi History Museum where you will find relics dates back prehistoric times. Enjoy a cultural show with dinner at the Tang Dynasty Theatre. Take a morning walk on the 14th Century Old City Wall. Fly to Shanghai and stay three nights at the Central Hotel. Spend a day exploring this gracious and cosmopolitan city. See the former Colonial Concessions along the Bund for a view of the ‘yesterday & today’ of Shanghai. Travel to Pudong and stop at the soaring Jin Mao Tower for a breathtaking panorama of the city. After a dumpling lunch, stroll along the alleyways of Old Chinatown, visit the Yu Garden and enjoy a river cruise before returning to your hotel. This evening enjoy an acrobatic show. Visit Shanghai Museum and enjoy your time at Tianzi Fang where many artists and local designers have set up art studios and galleries – a great chance to shop at the boutiques or just relax at one of the street cafes. This evening enjoy a farwell dinner. Farewell China as you board the Maglev, the world’s fastest train for a ride to the airport to join your onward flight.